Suitable for producers who have a smaller flock of birds or just require a lower volume feeder for individual pens. 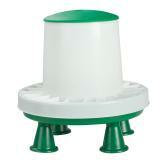 Protect your chicken feed and reduce waste by using an Ascot Rain Hat with the Ascot Feeder. Metal handle allows the feeder to hang. Feeder pan is easily cleaned. Legs elevate the feeder base 3 in. off the ground, helping prevent feed contamination. Optional rain hat protects feed from rain and snow. Fits top of Ascot Chicken feeders to prevent rain from soaking feed. The feeder eliminates waste and my chicks all have a chance to eat at the same time. I bought the rain hat and it worked out perfectly! I chose this feeder because of its size, it has a lid above the feed hopper, it has a grill to minimize waste and it can be suspended in the coop run. I am pleased at how 'solid' the feeder is and my 5 pullets took to it right away. They now waste less feed than before. Note that if you want to hang this feeder, you will need to drill a hole top center of the lid - very easy. I was needing a feeder that would keep the rain out. Originally, I found this same feeder on ebay- sent from the UK. I bought two and love them. So when I saw Premier carried them, I got two more. They are durable and easy to use. My only grumble is the feet are really hard to get onto the base (of course that also means they don't fall off!). 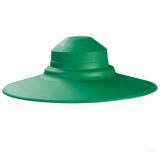 The rain hat is awesome- keeps the feed fairly dry and tends to discourage wild birds because they can't see the feed. My ducks make a mess no matter with or without the grill, but I'm just glad the feed stays dry in our wet Kentucky weather. 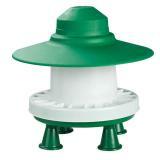 This is a good small flock feeder that I use under an awning (rain still can blow under it). I am raising some silkie chicks and found they are very wasteful with their feed. 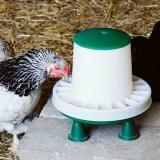 This feeder with the grill has made a huge difference in saving feed. It's very durable and easy to fill.